Aillwee is the 1143th highest place in Ireland. 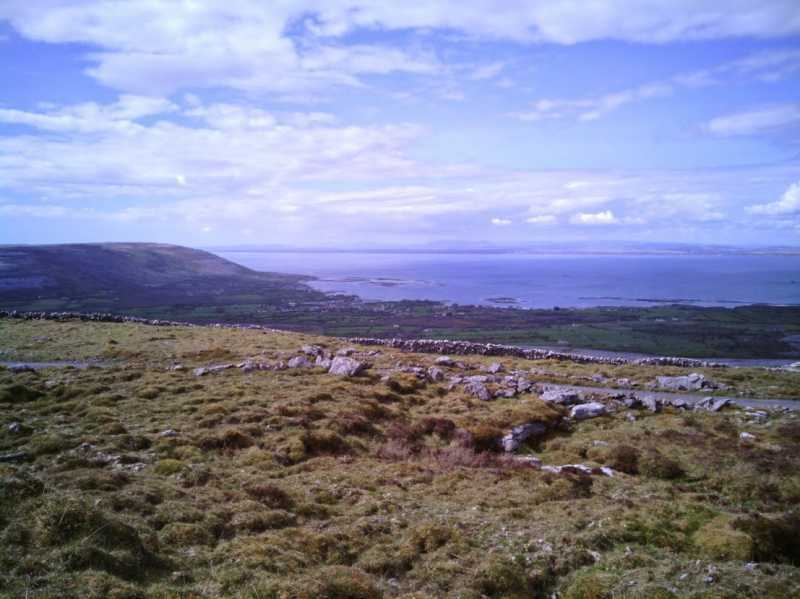 This hill is not much of a challenge but offers spectacular views of the Northern Burren, from Black Head to Abbey Hill and the Galway Bay in between. The top is near the farm road and marked by a small limestone cairn. There are two access routes, from SW at 10km roundtrip and only 150 elevation gain, from NE at ca 6km roundtrip and 270m elevation gain. I haven't tried the NE approach so far. From both sides the access is through a private farm but there is apparently a public right of way and the farmer is friendly as long as you leave all gates as found and do not disturb cattle. Approaching from SW, it is a long walk with little elevation change, you will see several doolin depressions and some neolithic tombs, no markers no tourists.. just cattle every now and then. The views opening to the north come as a shock when you approach the rim. If approaching from NE, you have the views all the time, just gaining prominence. This is near the Glenosheen Collar find site. A memorial to Paddy Nolan who found the precious collar is at the right farm gate. You need to take the left farm gate to access the summit, the right one is cul de sac.